This is in answer to a video request from my recent poll—I had no idea the opportunity would come up so quickly! 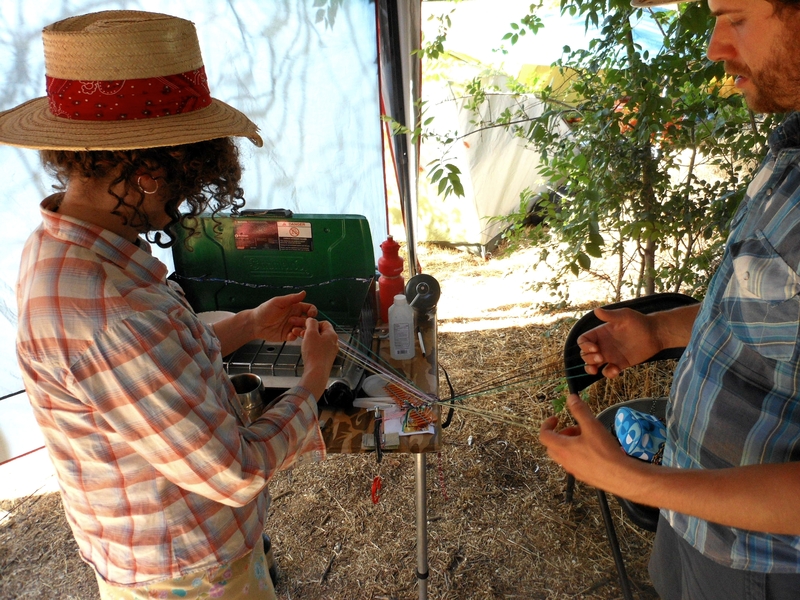 At the first of my two recent music campouts, Amy and Patrick both asked me to show them how to make a 5-loop braid. Right after they had each made one they wanted to learn how to make a 10-loop double braid by team braiding. This was their own idea, and in fact I was slightly shocked. I had mentioned double braids to them when they were looking at my braid samples, but I never expected they would want to learn them right away! I almost told them they should practice more first and learn team braiding tomorrow…Then I remembered they were musicians and I might never see them tomorrow. This was my golden opportunity to get a video! Wish I knew who to thank for the great jam of Devil Eat the Groundhog going on in the background! It had been ten months since my last and only real experience of team braiding (at Braids 2012), so Patrick and I had to figure it out together—which didn’t take long. Then I backed out to get a camera while Amy and Patrick figured it out together, also quickly and easily. Patrick and Amy’s double braid sampler: solid rectangle variation, flat variation, divided variation and beginnings of hollow variation. I love the way the totally random bunch of wild colors turned out! Ideally, I should have started them out with 1) bicolor loops, 2) somewhat longer loops—they are a bit cramped up with these relatively short loops, and 3) fastened the loops to something about chest-height, instead of a low table. 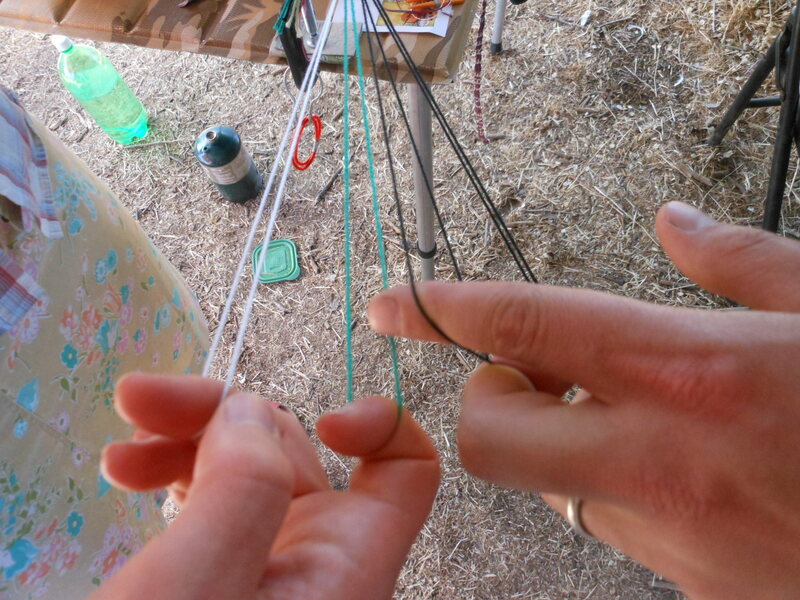 Note: This loop exchange works essentially the same way, regardless of the braiding method you are using – Amy and Patrick happen to be using the ‘V-fell’ braiding method I teach for square braids, but the loop exchange between the two braiders would be done in the same way even if they were using the ‘A-fell’ braiding method taught on fingerloop.org and other sites. The only difference would be that with A-fell braiding moves, Amy’s “exchanging” loop would normally be held on her middle finger with nothing on her index finger. For doing this exchange move, though, she might prefer NOT to shift that loop down to the middle finger right away, in order to perform the exchange with her index finger. Either way would be fine. 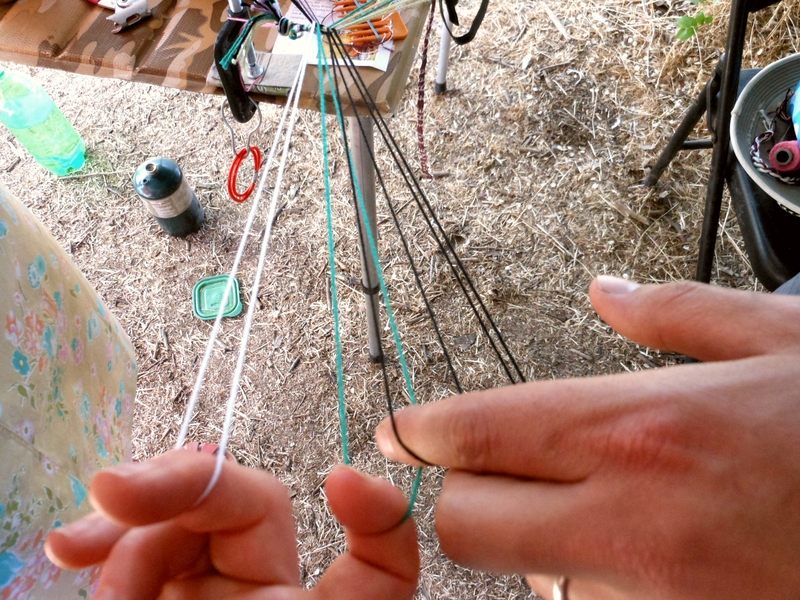 The two braiders start braiding with their loops arranged in mirror-image—the left braider (Amy) holds 3 loops on her left hand and 2 loops on her right hand, but the right braider (Patrick) has the opposite arrangement—2 on the left and 3 on the right. Their two inner hands both hold only two loops (Amy’s right and Patrick’s left hand). 2) Initiator reaching through own loop to get partner’s loop from above. 3) Initiator hooking into partner’s loop, about to draw it through his loop. 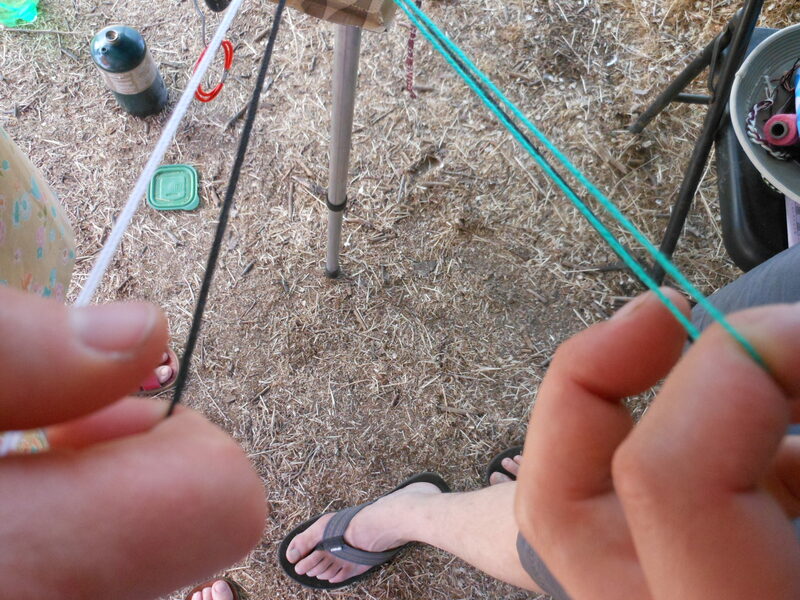 4) Initiator pulling partner’s loop through his own–loop will not be turned. Amy now has no loop on her index finger. 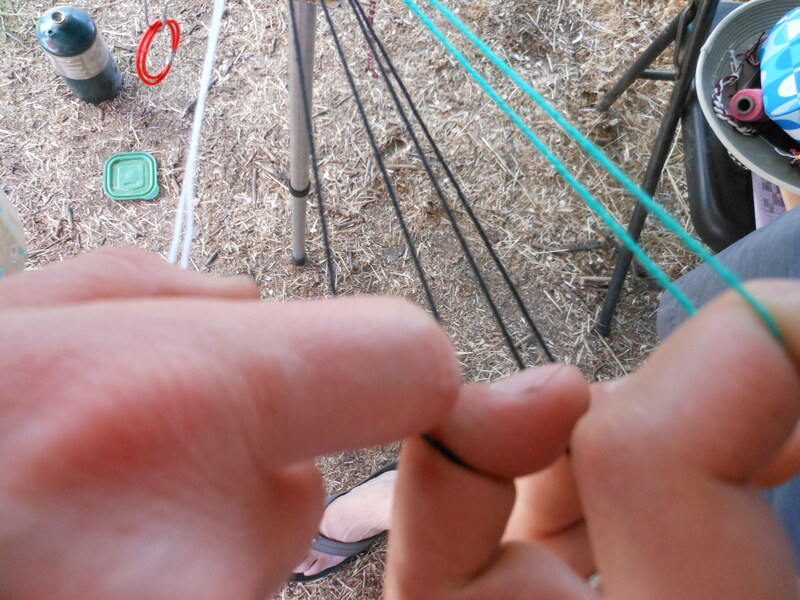 Patrick waits for her to take his middle finger loop (which her old loop just passed through). 5) Patrick (on right) is offering his middle finger loop to Amy. She hooks down into it and takes it without turning it over. The non-initiator does not have to pull a loop through another loop—the loop she takes off the initiator’s middle finger has already passed around the loop she just relinquished. Now the exchange is over, and a loop from each braider has crossed over to the other braider. Then the cycle begins again. When the two braiders exchange loops, the same one should always do the first move, so the loop exchange is consistently left through right (or consistently the opposite). 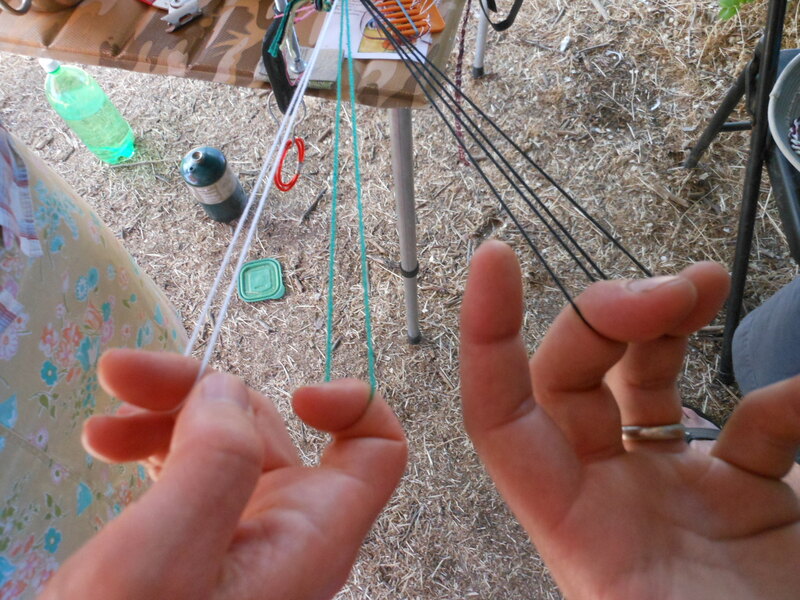 Since the two braiders do different tasks during the loop exchange, it’s a good idea to take turns and learn both parts, maybe on two consecutive braids. 6) The blue loop has just passed through the black loop and both loops have switched hands, without getting turned over. 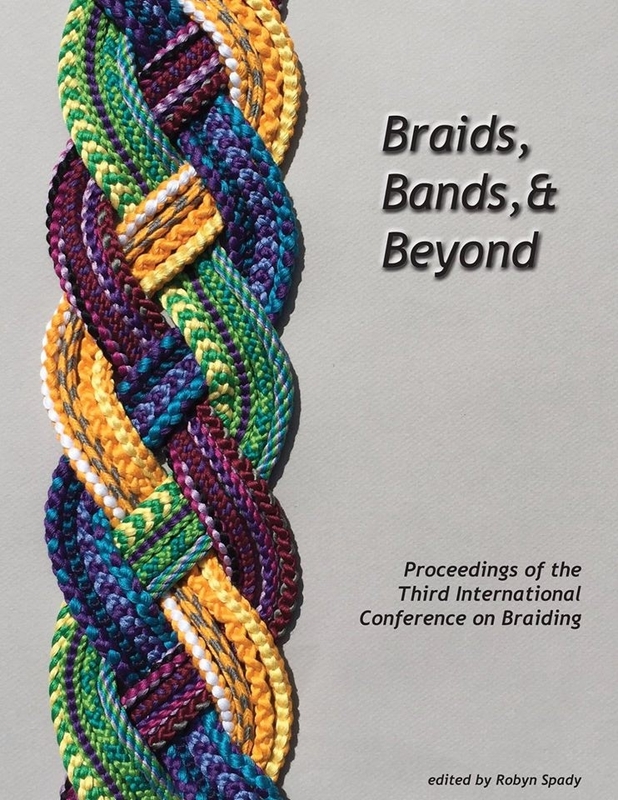 Ok, I hope this takes some of the mystery out of team braiding, and encourages other braiders to try it! I am very jazzed about doing it myself—this ended up being the first of three different times I got to team braid on my trip, and it is not only fun but also supportive…There are two sets of eyes to notice if mistakes are being made or steps left out, which was just as often ME forgetting something as the person I was supposedly teaching! Thank you Amy and Patrick for being so relaxed and good-natured while I hovered over you with the camera (hyperventilating with excitement), and for being such great braiders! 1) Here are links to photos of team loop braiding: one photo on LMBRIC (Sulawesi,Indonesia), and this photo on a historical reenactors’ site that shows 3 people cooperating in making the Katheren Wheele braid. 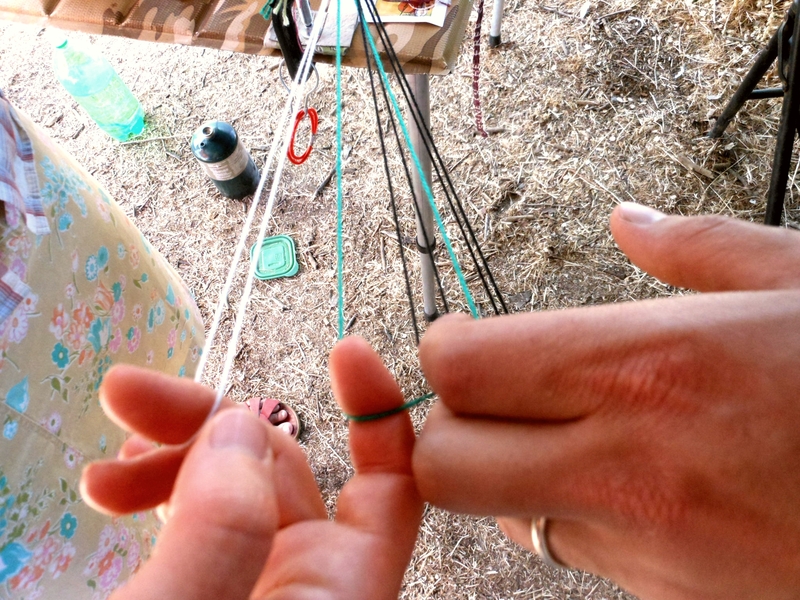 (Here’s Keiko Kusakabe’s photo of an Indonesian 3-person lacy loop braid). How about 5 people team braiding? This is from LMBRIC again)…Btw, you don’t need an extra person to hold the start of the braid, you can attach it to whatever you want. That extra person is great, though if you want to braid longer lengths–he or she can act as the ‘beater’ and tighten up the braid after each series of braiding moves. 2) There are other ways to effect the same exchange of loops between the two braiders. Any way that gets one of the two loops through the other with neither being turned over in the process would work. 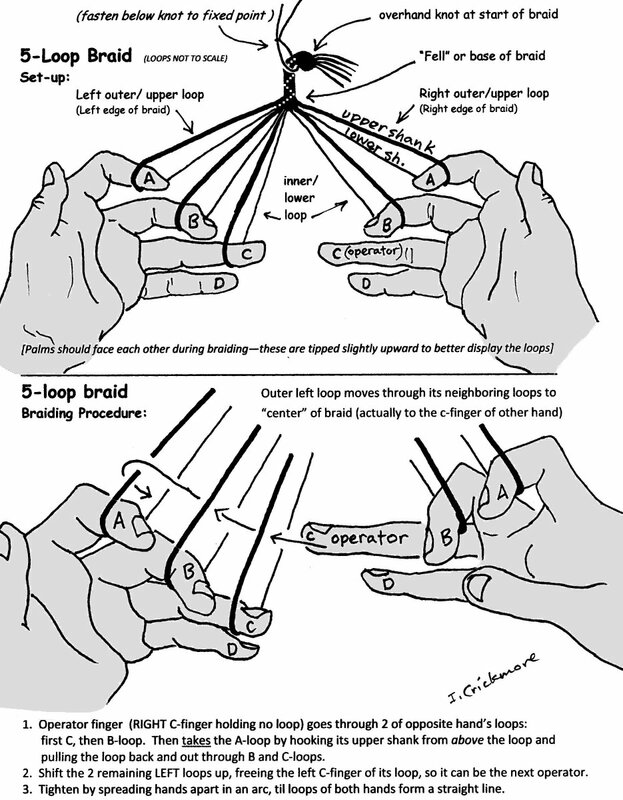 Old English Pattern Books for Loop Braiding (OEPB) teaches more than one way. 3) The main difference from how I teach this as a double braid done by a solo braider is that Amy and Patrick are each doing V-fell braiding, whereas the individual left and right hands in my equivalent solo-braider technique are actually braiding as if they were making A-fell braids. The two resulting double braids turn out “backwards”, but otherwise fairly identical to each other. Another minor difference is that I happened to start Patrick and Amy by having the exchange done “left loop through right loop”; whereas in my solo-braider double braid videos, I always pass the left loop around the right loop. This would be the equivalent of having Amy and Patrick stay in their same positions, but reverse their roles in the video – so Amy would do the first move of reaching through her own loop to fetch Patrick’s loop. This is a much more interesting difference, because it strongly affects how the braid turns out! When team braiding, the tightening is done by each braider before they exchange loops. After the exchange there is no need to tighten. I don’t find this convenient as a solo braider, instead I only tighten after the loop exchange, pulling the right and left “braiders'” loops away from each other, which is another way to tighten the whole braid. It’s probably not a good idea to do it that way as a braiding team, it’s easier to tighten against one’s own loops than to try to balance it against another braider. That difference in tightening creates a difference in the way the hollow double braid initially turns out—it comes out rectangular on the horizontal axis when braided by two braiders tightening separately, but rectangular with the wide sides on the vertical axis when tightened by a solo braider pulling left and right loops apart after the loop exchange between the two hands. These two outcomes can make the braid’s color pattern look very different, because the color-pattern of the two “side” surfaces is usually quite different than the color-pattern of the upper and lower surface of the braid. Even though the two outcomes look so different, there is no important structural difference between them. Both are hollow, and can be manually reshaped by inserting a narrow object to puff the braid out, and then (optionally) re-flattening it on any axis. See full copyright restrictions and permissions at the bottom of my sidebar (if you are using a smaller device, the ‘sidebar’ may appear somewhere other than the side of the screen). I have been busy and just got around to watching the video. I can just imagine your jaw dropping when they asked you to teach then team braiding. Really interesting to watch them figure out the easiest way to make transfers and such. Very cool. Got me motivated to start braiding again. Yay! Glad to hear it. I just got home from my last trip and saw your most recent experiment in my inbox, it’s fantastic! I’m going to have to sit down and figure out how you did it…In the meantime am planning to add it to the next readers gallery post (almost done).